Home Amazing The President's princess: Philippine leader Duterte defends his granddaughter Lovelie's opulent photoshoot as she is compared with Imelda Marcos after posing in extravagant ballgown to celebrate her 18th birthday. The President's princess: Philippine leader Duterte defends his granddaughter Lovelie's opulent photoshoot as she is compared with Imelda Marcos after posing in extravagant ballgown to celebrate her 18th birthday. Philippine President Rodrigo Duterte has defended his granddaughter's lavish photoshoot after she posed in a £10,000 dress for her coming-of-age ceremony. Pictures show 17-year-old Isabelle Lovelie Duterte, the daughter of the President's first son Paulo, in a red ballgown at the presidential palace in the capital, Manila. But the opulence of the event has sparked anger online amid claims it mirrored the activities of the family of the late President Ferdinand Marcos. The dictator's wife, Imelda, was known for amassing a vast collection of more than 3,000 pairs of shoes. The photo session, which involved a host of make-up artists and stylists, was part of her 'debut' party ahead of her 18th birthday and the dress is said to have been made by top designers including Garimon Roferos Couture, based in Dubai. images posted by the college student's team also show her in a pink gown posing before the seal of the President and beside the Philippine flag. A third picture shows her in a floral dress next to a fountain in the Palace's grounds. President Duterte has defended the photoshoot, held in early December in the Malacanang palace. Durterte's spokesman Harry Roque said there was 'nothing wrong' with Isabelle's photoshoot. 'I think his relatives, including his own grandchildren, can have their pictures taken in Malacanang,' he added. 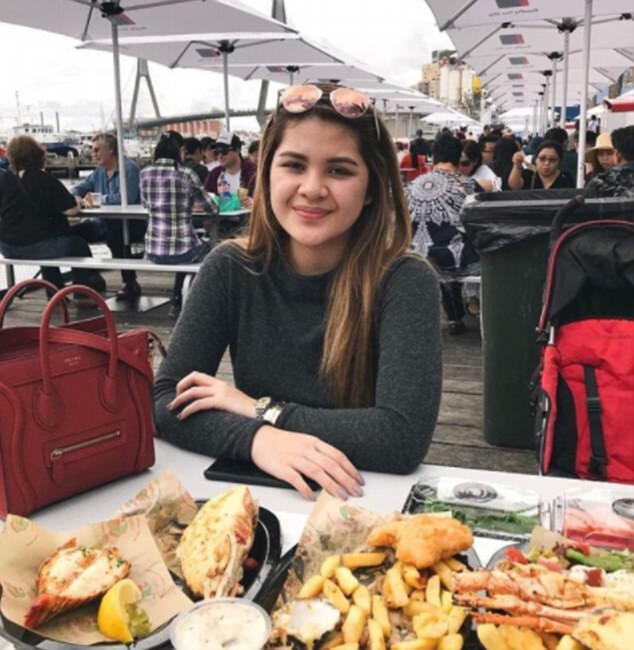 Rodrigo's eldest son, Davao City Vice-Mayor Paolo Duterte, is said to have paid for his daughter's phootshoot. But the event has sparked anger online, with estimations that her Disney-like red gown cost £10,000 alone. According to Twitter user Bib Macasaet said: 'People in [southern Philippines city] Marawi trying to live through the day. 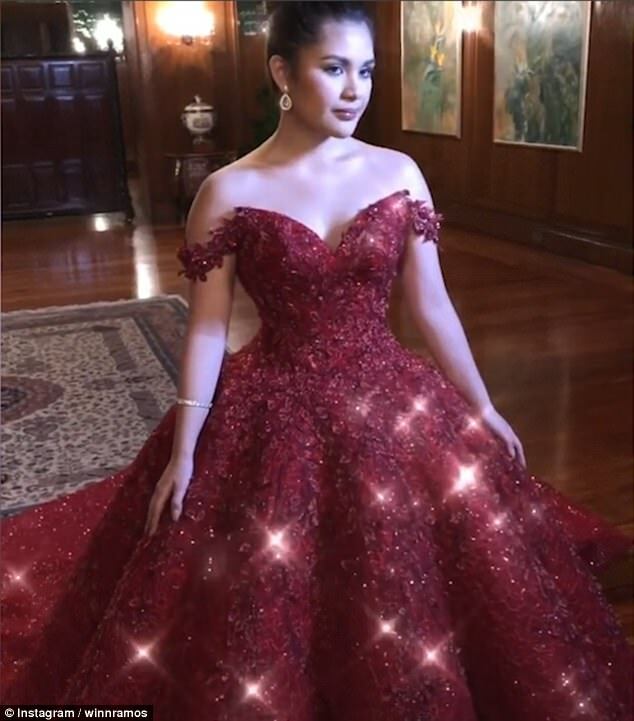 Isabelle Duterte at Malacanang Palace, posing in a blood red gown, getting ready to celebrate. She was famous for amassing a prized shoe collection that most women would kill for. Imelda Marcos, the wife of later dictator Ferdinand Marcos is believed to have owned more than 3,000 pairs before she and her husband were driven out of the Philippines. The Marcoses fled the country at the climax of the army-backed 'people power' revolt in 1986 and left behind staggering amounts of personal belongings, clothes and art objects at the palace, including the former first lady's shoes. The massive shoe collection, said to be in the region of 3,000 pairs, including top U.S. and European brands, astounded the world and became a symbol of excess in the Southeast Asian nation, where many still walked barefoot out of abject poverty. 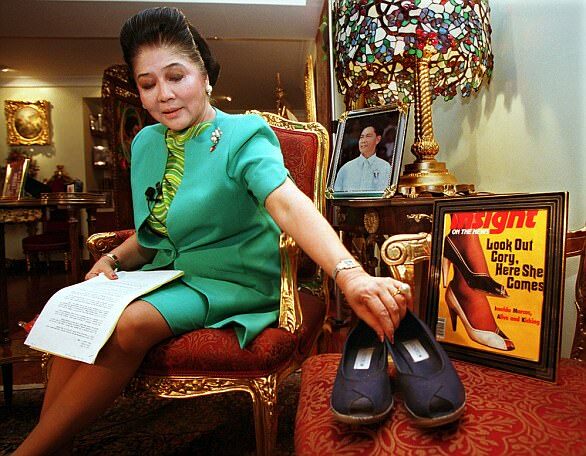 After the 1986 revolt, Aquino had Imelda Marcos' shoes displayed at the presidential palace as a symbol of the former first lady's lavish lifestyle. The shoes were then removed from public view and stored in the palace basement when Aquino stepped down in 1992. 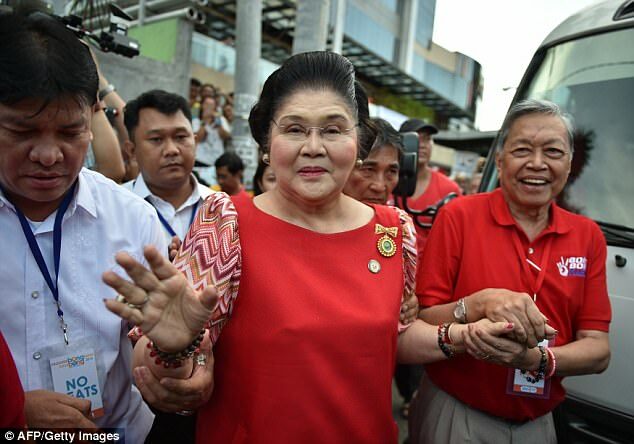 Imelda Marcos claimed many of the shoes were gifts from Filipino shoemakers in suburban Marikina city, the country's shoemaking capital, for endorsing their products. Marikina officials borrowed 800 pairs of her shoes in 2001 for a shoe museum, which has become a tourist spot. Massive flooding, however, damaged dozens of pairs of Marcos' shoes in Marikina in 2009. About 765 pairs, including famous brands like Gucci, Charles Jourdan, Christian Dior, Ferragamo, Chanel and Prada, survived the Marikina floods. In 2012, it was reported that the shoes still look remarkably new due to meticulous museum care, which includes displaying them in airtight and dust-free glass cabinets in an air-conditioned gallery, away from direct sunlight. The shoe collection was said to draw a daily crowd of 50 to 100 Philippine and foreign tourists, who almost always left in awe, museum manager Jane Ballesteros said at the time. Mrs Marcos, was accused but never convicted of stealing state billions to support a lavish lifestyle during Ferdinand's 20 year rule. Ferdinand Marcos died in exile in 1989. Among his own assets were paintings by such masters as Monet, Picasso and Van Gogh.